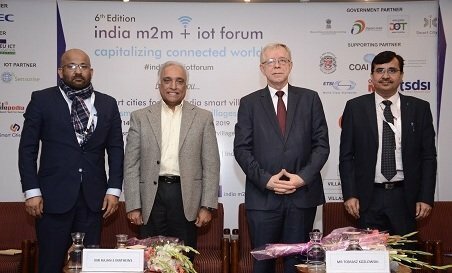 The 2019 m2m + iot forum India highlighted the need of forward-looking policies and a proactive government to play a role in the development of smart cities & villages on the bedrock of JAM Trinity which has 1bn bank accounts (Jan Dhan) + 1bn Aadhaar + 1bn mobile broadband users, already organized for the technological revolution in this space, thus, Capitalizing the connected World with the help of modern & niche technologies like 5G, GIS, IoT, m2m and others. Likewise, the governments effort to connect 2.5 lakh Gram Panchayats with BharatNet project was discussed to leverage the smart villages concept in India. “While the cities of India are fast progressing towards digitization, it is encouraging to note that digital solutions are being readily accepted amongst the rural population of India as well. To support this technology adoption, the Department of Telecommunications (DOT), Ministry of Communications, Government of India, has initiated projects to provide broadband connectivity for connecting various digital services and solutions across our Urban and Rural Landscapes”, added Ms. Sundarajan. The attraction of the m2m +iot forum 2019 was, NOT TO BE MISSED ‘Technology Show – by FIWARE Foundation member companies namely – NEC Technology India, APInf, MobilePedia and Smart Cities Lab Ltd where they demonstrated the OPEN SOURCE PLATFORM designed and developed by the FIWARE FOUNDATION– a market-ready open source software, combining components that enable the connection to IoT with Context Information Management and Big Data services in the Cloud.